I just discovered Bookvibe, a new (to me) service which provides book recommendations from your followers on Twitter. Amazon has announced a new way of paying authors for books available on Kindle: Beginning July 1, 2015, we'll switch from paying Kindle Unlimited (KU) and Kindle Owners' Lending Library (KOLL) royalties based on qualified borrows, to paying based on the number of pages read. We're making this switch in response to great feedback we received from authors who asked us to better align payout with the length of books and how much customers read. Under the new payment method, you'll be paid for each page individual customers read of your book, the first time they read it. This change of policy has provoked much comment in the worldwide press. If you are a self-published author, what do you think of it? Do please leave a comment, and, if the response is big enough, I'll provide a summary next week. Why do so many books by South Asian women writers have the same kind of covers? And why do those covers mostly seem to feature saris and fair-skinned women? These are questions addressed by Lisa Lau in a piece for online journal Scroll.in. Click here to read it. 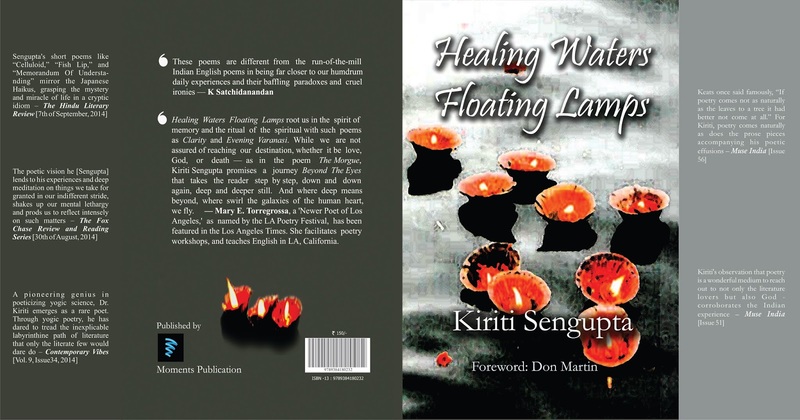 Healing Waters Floating Lamps is a collection of philosophical verses by Kolkata-based poet, translator, and author, Kiriti Sengupta. The poems explore humdrum daily experiences and reveal their baffling paradoxes and cruel ironies. Healing Waters has sold well on Amazon, USA. It is published by Moments Publication, Ahmedabad, Gujrat.